April 1, 2015 By Allyson 5 Comments This post may contain affiliate links. Read my disclosure policy. Look at the cheese!!!! Just look at it! Do you not want to eat that through your screen right now?! If not, you’re crazy (or maybe have a dairy intolerance…)! Thank goodness I had a little 6 year old around to help me take these awesome pictures. There is seriously nothing like the melted cheese shot. It’s no secret I love cheese; people I don’t even know approach me talking about my so-called love of cheese…well, it’s a great conversation starter, because not many people dislike cheese. Next time you’re at a party (serving this dip), try out a cheese question as an ice breaker. I bet $100 there will be someone who hates bleu cheese or goat cheese…there is always someone who isn’t a fan of those. Luckily for those few people, there isn’t any bleu or goat cheese in this recipe. 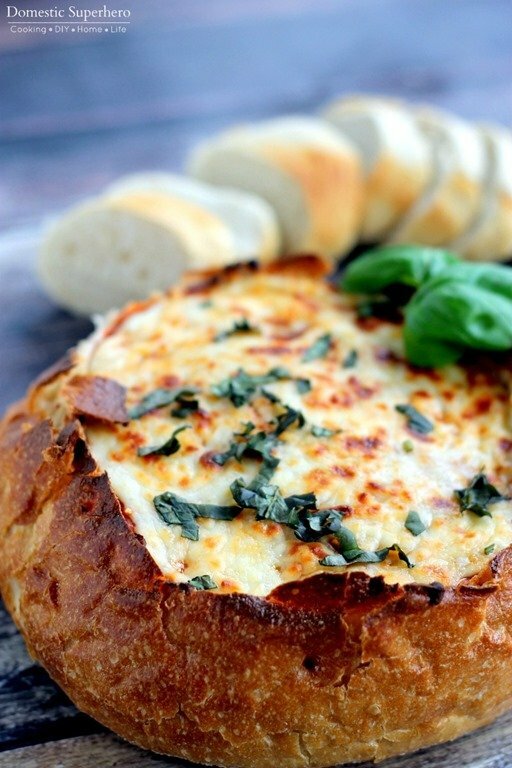 Like I said, this recipe only has 4 ingredients; bread bowl, cheese, marinara, and basil. That’s it. Sure, if you want to step it up a notch, you can add various spices and I suppose that would increase your ingredient count, however most people have basic spices in their pantry, so I’m not sure those would count as additional ingredients. 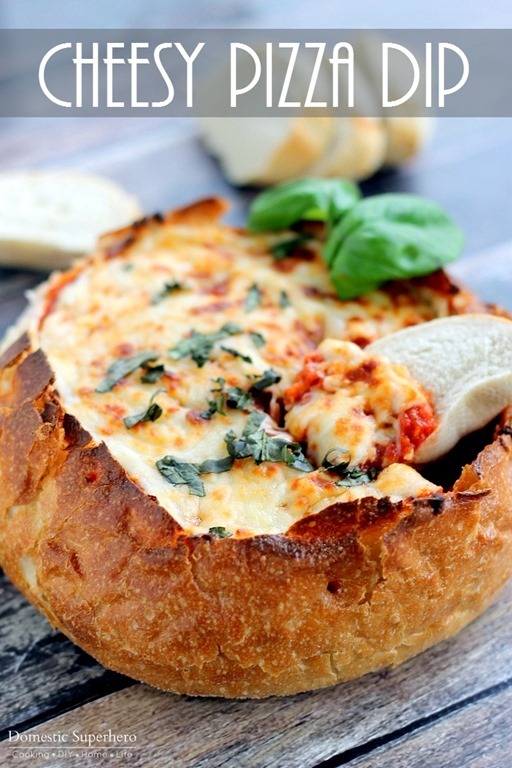 All you have to do is hollow out a large bread bowl (although this would be SUPER cute in mini bread bowls too! 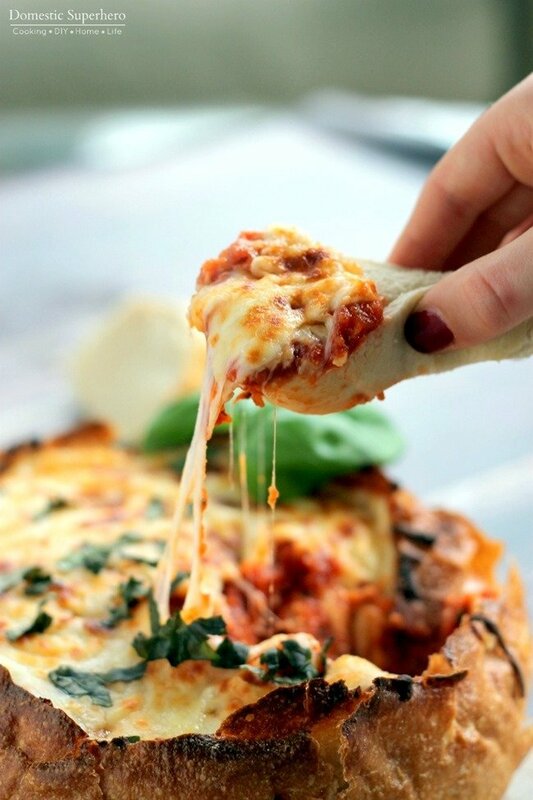 ), pour the marinara inside, top with cheese and basil, tent the dip with foil, and bake! That’s it! So easy! 2. Place bread bowl onto a foil lined baking sheet. Hollow out the middle, carefully as to not go through the bottom/sides of the bread. Pour marinara sauce into center of bread bowl; add oregano and black pepper to sauce, stir to combine. Sprinkle cheeses over the top of the marinara, covering where the sauce meets the bread (creating a 'seal'). Sprinkle basil over the top. 3. Tent foil loosely over the top of the bread bowl, you don't want it to touch the cheese, and place in oven. Bake for 30 minutes; remove foil and bake for 5-10 more minutes, or until cheese is melted and browning (could also broil on high for a few minutes watching closely). 4. 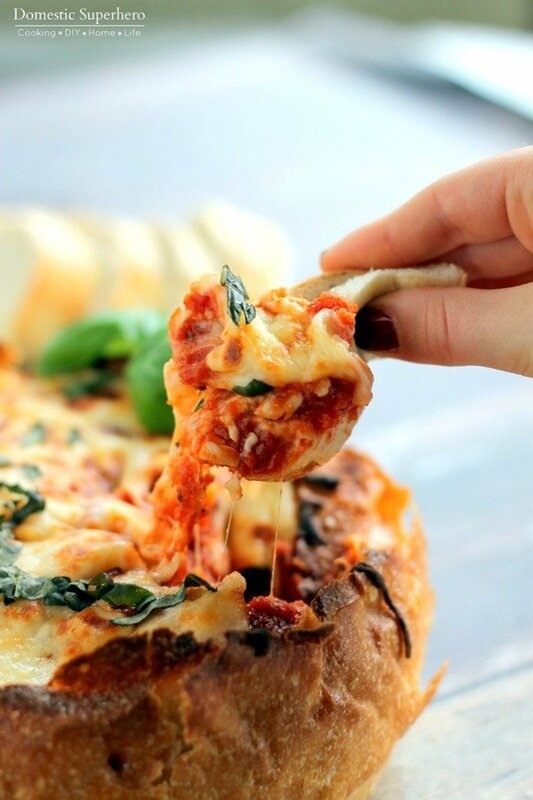 Serve with bread slices, crackers, bread sticks, or whatever you want! I usually place toothpicks around the top of the bread bowl (stuck into the bread close to the cheese), so that the foil doesn't end up falling into the cheese- you don't want the foil pulling off all of the cheese when you remove it!